Will self-publishing affect the meetings industry? I’m in New York City today and tomorrow to help close the August issue of Convene. 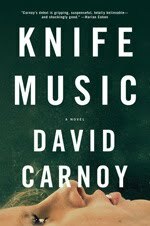 After I left our design studio tonight, I went off to a reading by David Carnoy, who has just published his first book, a thriller called Knife Music. (By day, Carnoy is executive editor for CBS Interactive, where he works with a good friend of mine, which is how I ended up at his reading.) I haven’t read it yet, but the story behind the story is a thriller in its own right: Before the Overlook Press released Knife Music in hardcover this month, Carnoy published it himself — as a print-on-demand title and a free iPhone app. His marketing savvy (and the quality of the book itself) attracted enough attention that he landed a two-book deal with Overlook. At his reading tonight, Carnoy was lighthearted and self-deprecating. More than anything, he seemed tickled that so many people had shown up as Barnes & Noble on Broadway and 66th to see a first-time novelist. But he had a serious message for wannabe authors: self-publish. He’s even written a 25-tip column on the topic for his day job. Because, Carnoy wonders, what do you have to lose? It makes me wonder if the self-publishing model is in any way applicable to the meetings industry. Have you ever heard of an event that began as a labor of love, a passion project created and staffed by a single dedicated volunteer, that has made the leap to the professional stage, with paid staff members, sponsorships, and so on? Even if you haven’t, I think there are things that meeting professionals can take away from Carnoy’s 25 tips, starting with the first one one: “Self-publishing is easy” — thanks to a variety of online applications that walk you through the process. So, too, are videoconferencing and virtual meetings. What are you doing to compete with — and co-opt — them?